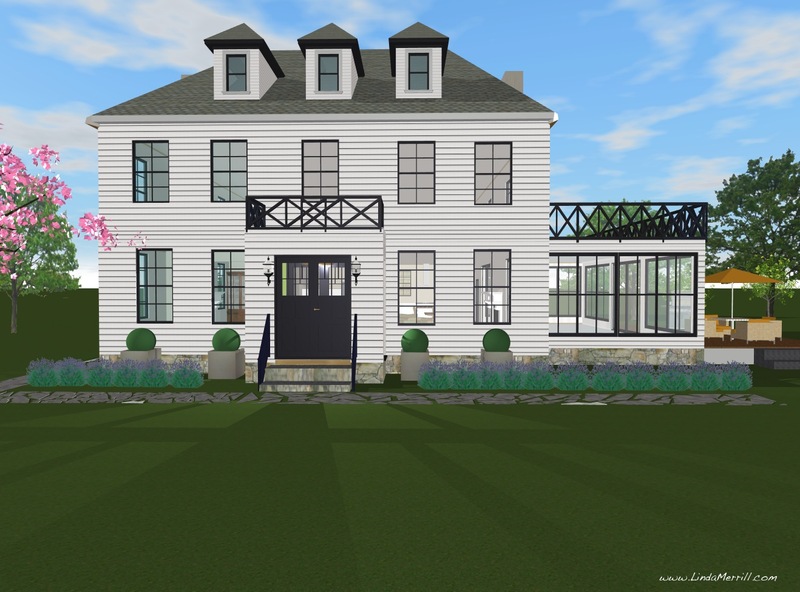 As I wrote last week, I’ve started planning my “dream home” as a way to improve my digital rendering skills. Even though I’m not in a position to actually build my dream home right now, it’s awfully fun to dream and you never know when a fortune will fall out of the sky (cough, cough). 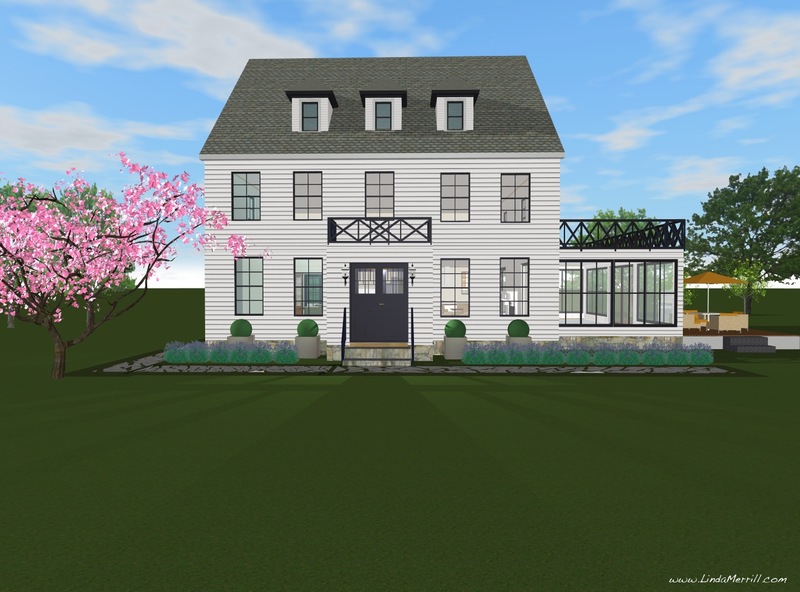 So, my original plan was for a classic New England saltbox design, but that’s gone out the window for a slightly more formal Georgian/Colonial style, which is basically a very symmetrical box. I love symmetry, so it works for me. When designing a home, it’s important that the design take into account it’s surroundings and topography. My favorite town in New England is Newburyport, where I lived for a few years and I do plan on moving back there at some point. It’s a wonderful old New England town with gorgeous, densely situated, homes, great shops and beach. Yes, this is also where Plum Island is, which has been all over the news this winter for its beach front homes that are sadly toppling into the Atlantic and being bulldozed literally as I write this. I don’t dream of living right on the water, though I do love being ocean “adjacent”. No, I love the busy main thoroughfares lined with beautiful old homes. 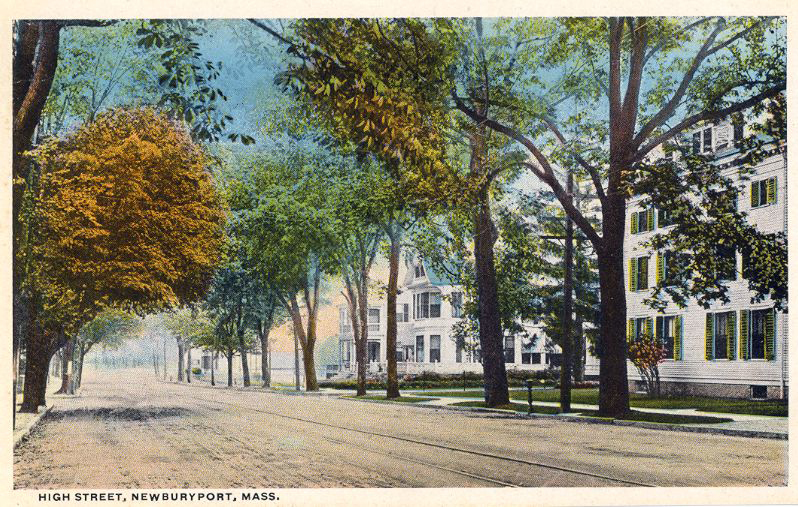 Circa 1900, but looks substantially the same, only with a paved street. 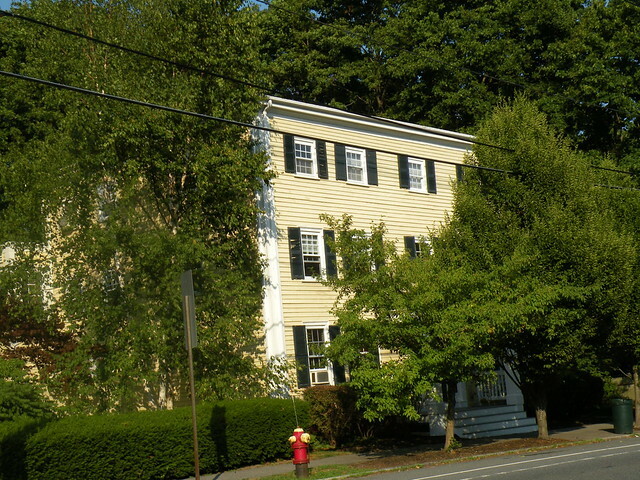 A classic Federal style house in Newburyport. And this is the house I had a condo in, which I loved, right on High Street. 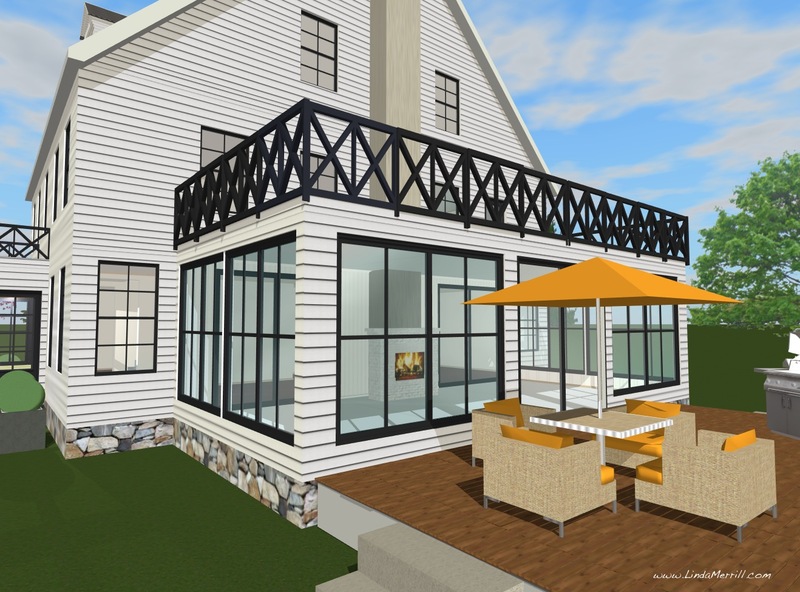 So, here is my house rendered with a hip roof (above) vs. gable (below). I do still have to work on the angles a bit… Functionally it doesn’t matter since it only effects the attic space. Thoughts? Also, remember there wouldn’t be a huge front yard, the house (in my imagination) sits right on the street, with maybe a fence, walkway and small garden. 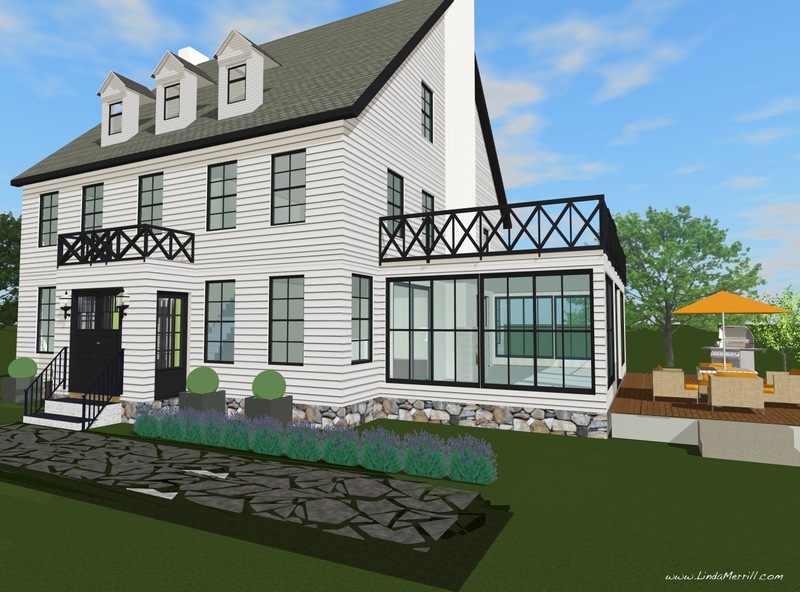 Here are the side views with large 3-season porch (and fireplace!) and a deck. Am now thinking I should move the deck around back for privacy and also because the properties aren’t that wide. And I’d need a driveway too. Here’s another peek into the entryway. I made the whole thing wider by 3′ from my original plan to accommodate bench seats and hooks to hang coats. I’m not sure about papering the ceiling or any details like that at this moment. And now here is the front hall. 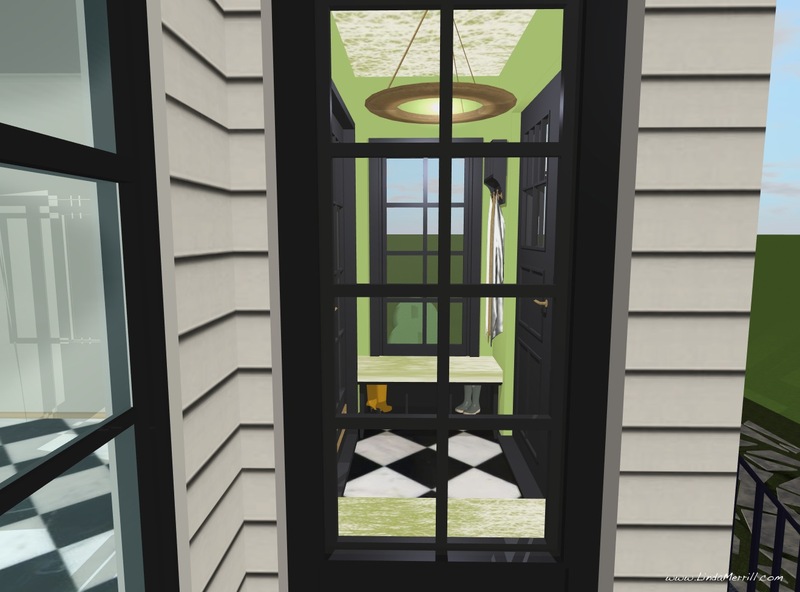 One thing cool about the software I’m using (Live Interior 3D Pro) is that I can remove walls, doors etc, from view to get a better view inside a small space. This angle would be the view when standing in the entry portico. 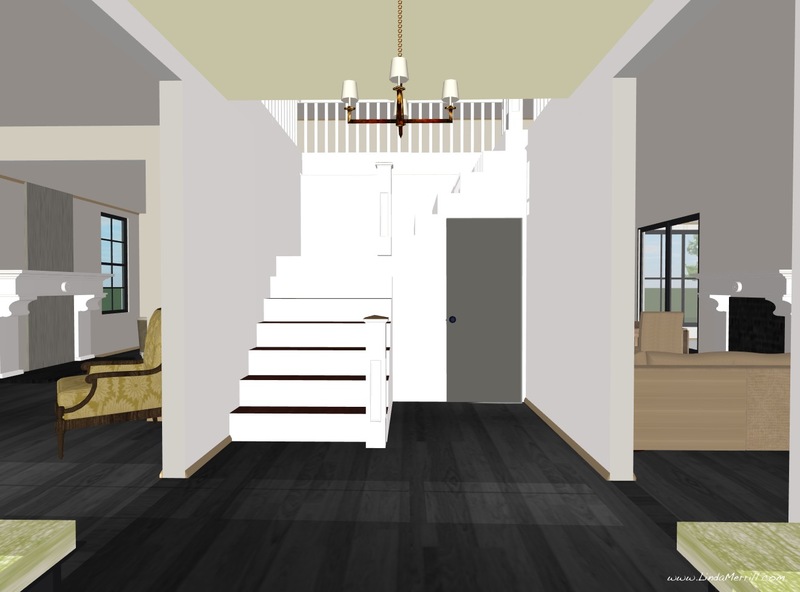 My original plan was for a standard straight staircase on the left and the hall on the right leading straight to the back of the house into the hall that connects the kitchen (right) and dining room (left). I was so proud of my first floor plan when I realized that I’d forgotten to put in a coat closet!! So, I am working on changing the staircase to be a right angle staircase, thus giving me room for a closet. It does close off the space to the back of the house, but it’s probably okay. 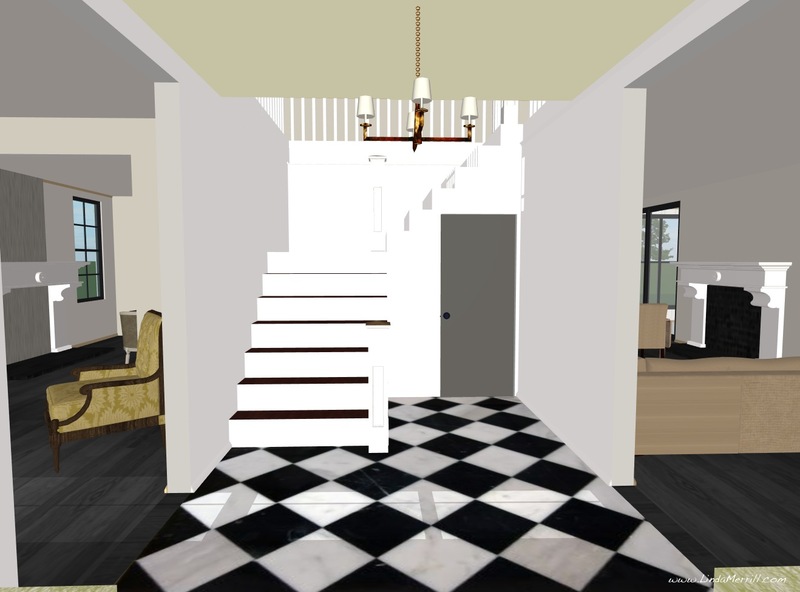 Meanwhile, I’ve put in black stained floors through out and am debating whether to do a diamond check in the front hall (continuing in from the entry portico, or just the plain black floors. Also, am not yet sure whether it would be painted diamond pattern, or marble. Obviously, painted is more casual and requires more work whereas the marble is more formal and yet easier maintenance wise. Oh, this is so much fun! My basic first floor plan has the formal side on the left with a small home office in the rear (with separate entrance), a fireplaced library with small dining table in the center, and a small sitting room in the front off the foyer. 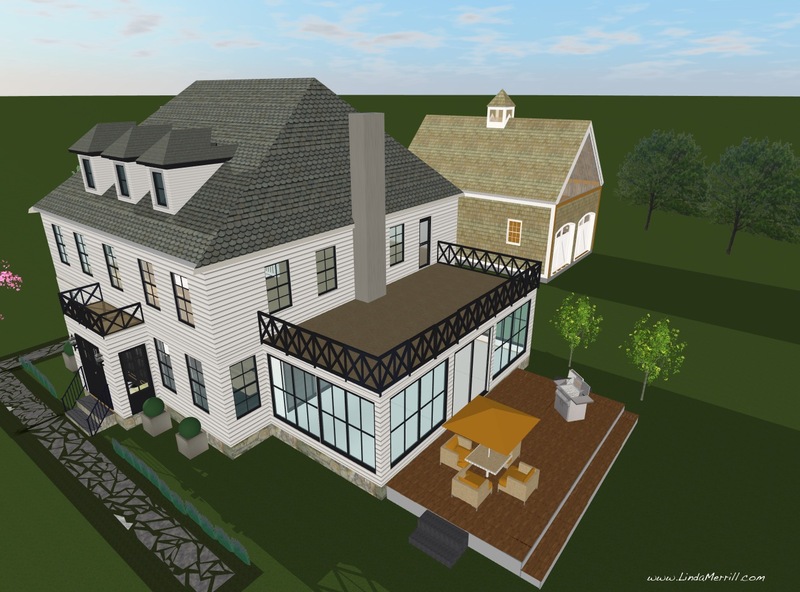 The casual living side is on the right and would be an open floorplan kitchen (rear) and fireplaced dining area and family-room style sitting area off the foyer. Lots of details and thought still needs to go into these spaces. Would love to hear your thoughts! I’ve got a Pinterest board filled with inspiration images if you want to take a look!